No. 7016 in 1943, is leaving the yard for the Quay with scrap wagons. Where the points ended, was the border between BR and Stockton Corporation. The building on the left was owned by the T.T.S Co., and known as the coffee warehouse due to it storing Nescafe there, which apparently the staff were never short of. 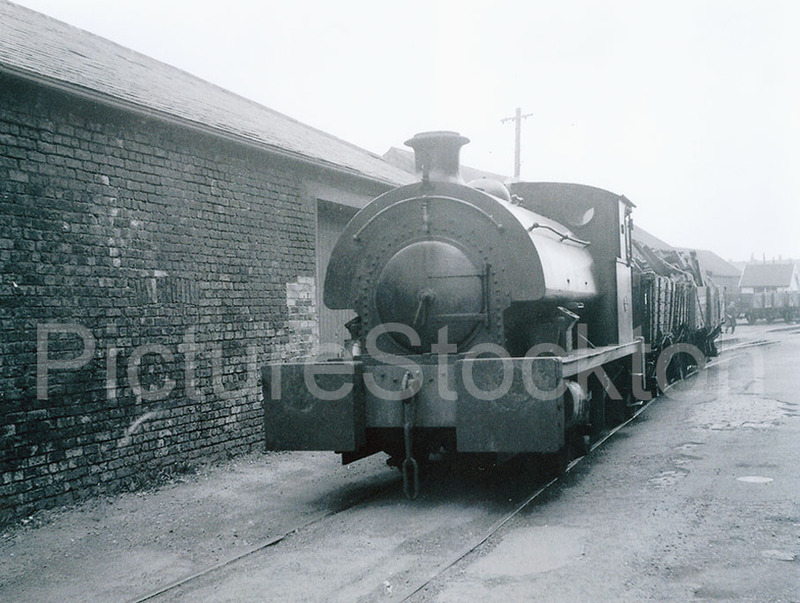 Had a few arguments with either that or a similar Saddle tank Loco along that stretch of Quay, the low building behind was used by Quayside Engineers to assemble steel work as it had a long clear floor. On leave I was driving the cranes for them, there was a ramp down into the building and a low doorway so I had to nose the crane a wartime Morris forward jib with the steel across the line sometimes with the back wheels off the road, no H&S then once committed you had to go. The Shunter driver objected if he could not get a run onto the Quay sending his Banksman to tell me to back off. If we were manoeuvring long beams through the door not an easy thing to do. The ensuing arguments kept his steam pressure up I do not know what it did for the loco. I had no idea what the building had been used for, it was much lower floor level than the rail line so must have had a river loading wharf at one time. All those buildings went when the river side was cleaned up although the old Quayside Engineering Building on Brougham Street is still there as a Building Supply Warehouse.